A unique selection of Phi Mu Sorority gifts and Phi Mu Sorority products. Phi Mu Toiletry or Cosmetic Bag or Phi Mu Sorority Travel Organizer - Top Gift Idea for Big or Little Sis! Phi Mu Toiletry Bag or Phi Mu Sorority Cosmetic Travel Bag Organizer Gift Idea for Big or Little Sis! 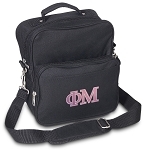 Phi Mu Hanging Toiletry or Cosmetic Bag or Phi Mu Sorority Overnight Organizer - Great Gift Idea for Big or Little Sis!